Shell Oil Company (U.S.), is part of one of the world's largest corporations, and this tin metal sign is evocative of the gas station signs of the late 1940s through the 1960s. 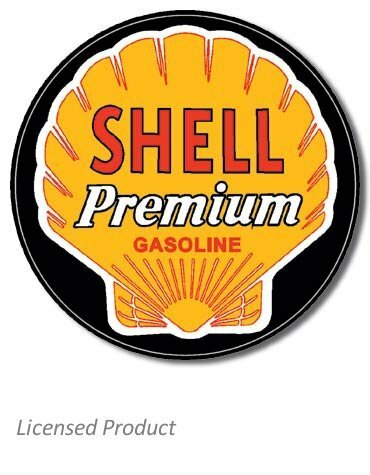 This licensed reproduction of the "Shell Premium Gasoline" sign, will make a great decoration for the garage, office or den of any motorhead. A great gift. This is a metal sign, made in the U.S.A. Measures 11.75 inches round. UPC: 6-05279-10612-7 | Part No. 612. Ask a question about "Shell Premium Gasoline" Tin Sign.